Tickets are available RIGHT NOW for the La Lunar Dance Party at La Trobe at Beechworth so just CLICK HERE to see how you can get your’s before they run out. Don’t forget if your’e ever travelling from Melbourne to Sydney or reverse then be sure to Stop in on the North East of Victoria and Border Region of Albury/Wodonga with massive lakes, rivers, snowfields and natural forest a wealth of beautiful scenery and peace to be had. Bye for now and hope to see you all somewhere in the North East of Victoria, Australia soon. Go to our website to see recent updates to the Spring Migration 2009 Program. The list of events is growing rapidly. This year’s festival will go from 28th August, 2009 through to the 6th September, 2009. So get to the website and check the new updates. Tickets are available NOW. $40.00 for the “Unite the Clans” Dance Party. The first three days will be hosted at Falls Creek . Spring Migration, with great deals and activities to end winter and bring us all into spring. These events will be great fun and a great addition for all of our visitors from around Australia and the world. 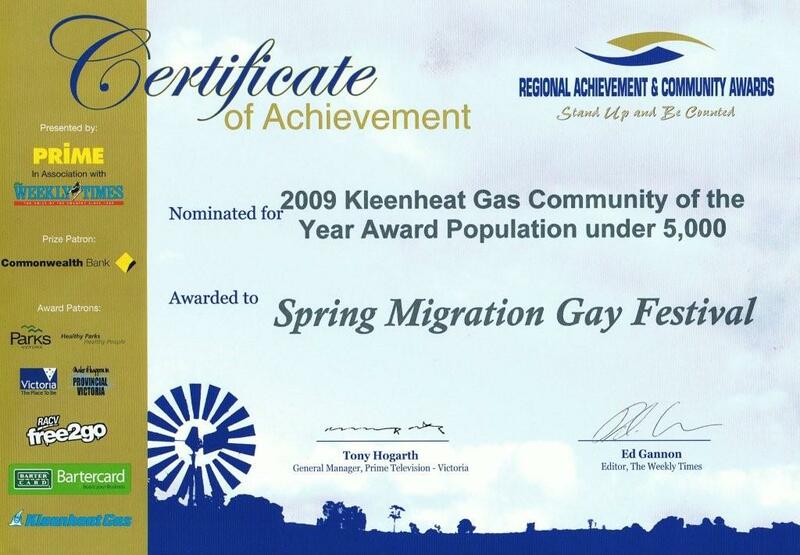 The best that North East Victoria has to offer. to the outback gold towns of the Indigo Shire. This year’s event will truly be a life-time experience on the gay calendar not to be missed. Take some time out and be part of this magnificent experience.